This week's tablehopper: these vagabond shoes, are longing to stray. One of the many signs in the Bimbo’s 365 kitchen. Photo: © tablehopper.com. It’s definitely an amazing way to start your week when you find out you are one of the 15 finalists in the Time Out New York Ultimate New York Life contest! I know, wow! Yours truly’s post (Seven things San Francisco restaurants need to stop doing, like, right now) is #1 on the page, and will hopefully be number one in votes, because the winner gets an apartment rent-free in New York City for six months and will write for Time Out about New York’s restaurant, nightlife, and city scene. Yes, it would be a dream come true! PLEASE TAKE 30 SECONDS AND VOTE FOR MY PIECE. (Really, go ahead and stop reading and do it right now.) Big bonus points if you can share the post, post it on social media, tell your friends, tell your mama, let’s get the hopper to NYC! I’d so appreciate anything you can do to help me win this amazing experience! We have two weeks to vote! Grazie!! It has been a whirlwind of WHOA over here this past week, starting with co-emceeing (with Brian Boitano!) the James Beard Foundation’s Taste America Tour at Bimbo’s 365 Club on Friday night. It was a fantastic event, featuring an all-Italian menu paired with local wines (but Italian varieties!). One of my favorite parts was actually having access to Bimbo’s early in the evening, with the opportunity to take in all the details of that incredible vintage club. Normally I’m there at a show, when I don’t quite get to notice all the extraordinary touches, from the saucy artwork to the vintage sconces. The absolute highlight, however, was having chef Michael Tusk invite me into the kitchen—what a time capsule! So rich with character; if those walls could talk. Thank you to the entire Bimbo’s staff for hosting this event with such flair. It was a great moment for me as a San Franciscan to be on that stage, something I had never even considered happening. I posted an album here, be sure to take a look! On Saturday, this city mouse swapped in her platform heels for something more appropriate for the country, and I attended the annual McEvoy Ranch harvest party. It’s always so faaaabulous, with McEvoy wines and everything catered by the inimitable Paula LeDuc, and we lucked out with a balmy October day. Great crowd, music, and more. I’ll have pics posted later this week! Harvest started, so I’m getting ready for my olio nuovo in a couple of weeks. We’ll see you again on Friday, enjoy the week (maybe I’ll see you at Ottolenghi on Wednesday?). And please don’t forget to vote for my piece, thank you! Kimchi fried rice with pork belly and soft-cooked egg. Photo: © tablehopper.com. The Green Cardamom Fizz and Bloody Mary at 1760. Photo: Wes Rowe Photography. Crab fat congee with crispy pork, soft-cooked egg, and heirloom tomato and corn. Photo: © tablehopper.com. Fingerling potatoes with charred avocado, cilantro, and roasted peanuts. Photo: © tablehopper.com. Cardamom beignets with Thai basil-chocolate sauce. Photo: © tablehopper.com. THIS EVENT IS SOLD OUT, THANKS EVERYONE! You may have caught the news in tablehopper last week that ~1760~ has announced their chef is Carl Foronda, who is integrating some inspiration and dishes from his Filipino heritage on the menu. I went by for brunch on Sunday, and let me tell you, it’s one of the tastier new additions to our local scene. So let’s do it up and have a tablehopper gathering! On Sunday November 8th at 12pm, we’ll be hosting a boozy tablehopper brunch at 1760 with Campari America. It’ll be a great way to explore 1760’s menu, and we’ll be taking over the communal table in the front for a family-style feast. The menu includes an Aperol Sbagliato on arrival (a special creation for our event by bar manager Christopher Longoria), one-eyed jacks with quail eggs, lemon mustard, and bacon; squash blossom tempura with ponzu, katsuobushi, and fennel fronds; and Little Gem salad with buttermilk-wasabi dressing, fried capers, and watermelon radish. Next up: the crab fat congee (wait until you try this!) with crispy pork, soft-cooked egg, and heirloom tomato and corn; kimchi fried rice with pork belly and soft-cooked egg; and fingerling potatoes with charred avocado, cilantro, and roasted peanuts (this dish rocks). The pairing: the red bell pepper and cucumber Bloody Mary with sriracha, lemon, thyme, and SKYY Vodka. The last round will be cardamom beignets with Thai basil-chocolate sauce, and to drink, the Green Cardamom Fizz with cardamom cream, lime, egg white, club soda, and Bulldog Gin. It’s going to be a total tour de force, and the whole meal (with three paired cocktails) will only put you back $65. Seats are very limited, so get your ticket ASAP! For obvious reasons, please don’t drive. Brunch starts at 12pm, and we’ll be there until 2pm or so. If you have dietary restrictions, you have to let us know ahead of time—since it’s going to be family style, we can’t make accommodations on the fly, thanks. Looking forward to sharing this amazing menu and killer cocktails with you! Owner David Lynch. Photo: © tablehopper.com. Exterior of St. Vincent. Photo: © tablehopper.com. Earlier this month, David Lynch of ~ST. VINCENT~ in the Mission announced he was going to be changing the format to more of an enoteca/wine bar—with a focus on retail sales—and less of a restaurant. He is unveiling the new format this week, after hosting chef-farmer-author Chris Fischer on Thursday October 29th, who will be cooking from his new Beetlebung Farm Cookbook (you can view the menu and reservation details for the event here—three words: lobster pan roast). After that inaugural pop-up event, the menu will shift to being more enoteca in style, with all-day appeal. Dishes include tramezzini and salads, plus other small plates, and happy hour will bring some cicchetti and snacks. Lynch is working with Giovanni Airaghi on the menu, a Milanese, whom he met at the Jackson Place Café while he was working at Quince (the man reportedly makes a mean cappuccino). Look for the menu to ramp up even more in coming weeks. And since it will now be easier for guest chefs to come by for pop-up nights, look for more special events to happen in the future as well. Friday will be a very soft opening, and you’ll probably want to come by on Saturday for porchetta panini (12pm-6pm)—and there will be a casual wine tasting. While the wine list has always been multinational in style, look for even more Italian wines to be present as the retail part of the business will be coming to the forefront. If you taste something you love, you can buy a bottle and bring it home. (You’ll notice some changes in how the space is now laid out.) What this new retail model also means is that instead of paying a restaurant markup (typically three times) for wines, guests will just pay the retail price plus a $20 corkage fee. So guess who is going to be drinking some screamingly good deals? Yeah, you. There will also be a St. Vincent wine club coming soon, and look for lots of tastings, especially on Saturdays. Hours will be Mon-Sat 12pm-10pm, so you’ll be able to come in whenever, and there will no longer be the need for reservations (although those will be accepted for large parties). Expect some day drinking in your near future. The dining room at Iza Ramen. Photo: © tablehopper.com. Kitchen ready for action. Photo: © tablehopper.com. 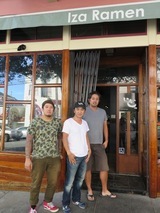 The Iza Ramen crew (chef-owner Ritsuo Tsuchida is in the middle). Photo: © tablehopper.com. Iza Ramen. Photo via Facebook. After popping up for about two years at Blowfish Sushi, ~IZA RAMEN~ is opening in the former Squat & Gobble in the Lower Haight. Chef and partner Ritsuo Tsuchida—who has also been the chef-partner at Blowfish Sushi in the Mission since it opened—was originally a sushi chef in Tokyo, and he returned to Japan to go to ramen school. He wanted to create a space that has an approachable price point, and after two years of running the pop-up, he has a good sense of the kind of ramen he likes to make (and what his customers like to eat). His broth is a combination of chicken broth, tonkotsu, and some bonito tuna and vegetable broth. They wanted to purchase their own noodle-making machine, but the sticker shock was too much ($40K), so they may be able to purchase one later on. There is ramen and tsukemen (which comes with a dipping soup), both available spicy or regular, and a vegetarian ramen will be available as well (all $11.50-$12.50). Additional toppings range from spicy kimchi to black garlic oil. The expanded menu also includes some izakaya-like bites, starting with snacks like housemade pickles, garlic edamame, and hot appetizers like takoyaki, chicken gyoza, and spicy mabo tofu, plus yakitori. Cold appetizers include salmon or Wagyu steak tartare with housemade potato chips, Wagyu tataki, and bincho tuna carpaccio. Since they have a beer and wine license, you’ll be able to enjoy some good pairings with these dishes (sake too!). And if you want a rice bowl, there’s a hearty one with chashu pork and another with sweet and spicy fried chicken (both $7.50), as well as shrimp fried rice ($8.50). Interestingly, the Iza weekend pop-up will continue at Blowfish into November, and then in December, the pop-up will be called Ramen JuBay and focus on a tonkotsu broth. The space has a contemporary look that’s a bit rustic with an industrial touch too. There are 50 seats, primarily at wood tables with metal trim, and there is a long wood banquette along the main wall (they stained the wood on the backrest and bench 10 times). There are two kinds of pendant lights, giving the space a polished look, though it still feels approachable. The soft opening is this Thursday October 29th for dinner, 5pm-11pm nightly, and then lunch will begin next Thursday November 5th (11:30-2:30pm). Hours will then be adjusted as they get a sense of the neighborhood. 237 Fillmore St. at Haight, 415-926-8173. The famed barbecue pork roll. Yelp photo by Steve L.
Contemporary meets old school (the tabletops, stools, and numbers on the wall!). 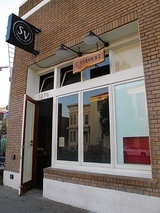 Yelp photo by Steve L.
But like we reported, the new location has multiple floors (just like the previous location), and they even installed a dumbwaiter (ahhh, nostalgia). 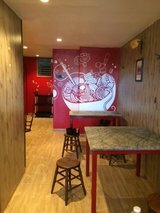 You’ll notice other original artifacts in the space, and many of the original menu items, too, from the barbecue pork rice noodle roll to jook to wonton soup. Look for beer and wine to come soon, and the bakery part of the business to ramp up too. Hours are a bit of a moving target, but for now they’re open Mon-Tue 11am-3pm, Wed-Sat 11am-3pm and 6pm-11pm, closed Sun. The eventual plan is to be open Mon-Tue 8am-3:30pm, Wed-Fri 8am-3pm and 6pm-4am, Sat 10am-4am, Sun 10am-6pm. 715 Clay St. at Kearny, 415-989-8898. The exterior of The Lab. Photo: Albert Law. Dinnertime in the cozy space. Photo: Albert Law. Alejandra Espinosa’s green plantain tostones with poached egg, piquillo coulis. Photo: Albert Law. Some exciting news for Dogpatch residents (and people like me who love the neighborhood): local social dining marketplace Feastly is going to be hosting weekly pop-ups Wednesday through Sunday nights in Recchiuti’s ~THE LAB~ (previously the cozy Piccino space). Different chefs will be rotating on different nights, so one night could be Robin Song with his upcoming Junju, while the next night might feature Alexander Hong’s Sorrel. It’s a great way to try the food of chefs forging their way to opening a brick-and-mortar location. Prices will range from $32 for two or three courses to $75 for a seven-course meal. The first event features Robin Song this Friday October 30th (and upcoming Fridays), followed by Brasserie Quito by Alejandra Espinosa on Wednesdays (“a night in France with a hint of Ecuador”), Ichido by Geoff Reed on Thursdays (“fished and foraged omakase,” with dishes like marinated anchovies, heirloom tomatoes, ginger, smoky yuzu kosho aioli, and sesame crostini), and Alexander Hong’s Sorrel (“seasonal and market-driven”; think duck egg raviolo with Swiss chard and ricotta) on Saturdays. Sunday suppers, brunch, and a nightly schedule will be coming soon, including events from La Cocina graduates. Follow the schedule here. Do note that all dinners are ticketed, so there are no walk-ins. All tickets include tax and tip, and some meals include wine, and some are BYOB. Use my tablehopper link for $10 off your first Feastly meal! Recchiuti will continue to host his own Taste Project pop-ups, brunches, and third Thursday paella nights. 801 22nd St. at Tennessee. The interior of ICHI Kakiya. Photo by Darren Samuelson. Some changes are happening at ~ICHI KAKIYA~, which will be going dark after service (and handing out candy!) on Halloween. Partners Tim and Erin Archuleta will be experimenting with hosting pop-up dinners in the space in early 2016, as well as featuring other collaborations with chefs and friends. You’ll see some of ICHI Kakiya’s crew over at ICHI Sushi + NI Bar, but you should still come by for some final oysters this week. 3369 Mission St. at Godeus, 415-814-3877. The dining room at Cala. Photo by Chloe List. 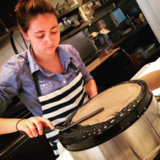 Petit Crenn: now making buckwheat crêpes! Photo via Instagram. Just this past Sunday, ~CALA~ launched Sunday brunch service. It’s a beautiful, airy space, so it will be quite the chic spot for brunch. The menu includes some of the seafood-focused dinner items, like the sopes playeros con pescado adobado, but you’ll also see some meatier items, like torta ahogada with carnitas, and enfrijoladas (black bean sauce-coated enchiladas with chicken and Point Reyes Toma cheese). Also on the menu: DF classics like molletes (a toasted and custom-made Tartine bolillo spread with puréed black beans, melted cheese, and pico de gallo) and chilaquiles rojos o verdes with a fried egg. There is also French toast with Asian pear, walnuts and piloncillo, and fruit dishes like Crenshaw melon with yogurt, honey, and piquin chile. You can come by for brunch cocktails, like the Jamaica with cava and hibiscus, a Mexico City-style michelada, and a Bloody Mary made with St. George pepper vodka, fresh tomato, and chipotle. Served Sun 10am-3pm. Just this morning, ~PETIT CRENN~ opened its doors for breakfast and lunch. A Breton-inspired breakfast, including buckwheat crêpes, oeufs à la coque, fresh fruit, and pastries from Jane bakery will be served Tue-Sat 8am-11am. Lunch starts at 11am, serving tartines, salads, and a roasted fish of the day until 2:30pm. No reservations. 609 Hayes St. at Laguna, 415-864-1744. ~CHUBBY NOODLE NORTH BEACH~ is now serving lunch daily 11:30am-2:30pm (they are also open for dinner 5pm-10pm). (Via Hoodline.) 1310 Grant Ave. at Vallejo. The exterior of Gus’s Community Market. Photo: Dana Eastland. © tablehopper.com. The future produce section. Photo: Dana Eastland. © tablehopper.com. The future home of Gus’s Community Market Café. Photo: Dana Eastland. © tablehopper.com. A report by Dana Eastland: Back in March, we shared the news that the Vardakastanis family, who owns Noriega Produce in the Sunset and Haight Street Market, would be opening a new grocery store in the Mission, called ~GUS’S COMMUNITY MARKET~. I had a chance to swing by recently and take a look at their progress and hear about their plans for the space. Dimitri and Bobby Vardakastanis are partners in the market—and Gus’s sons—and they showed me around the new space, which is on the ground floor of a multi-unit building. It’s currently slated to open Wednesday November 11th. The entrance of the market features a small café, where shoppers (and anyone else) can stop for a cup of coffee, tea, or fresh juice. The space will have plenty of outlets for those wanting to get some work done, and they hope to add some outdoor seating, as well. When you enter the store from the café, the first thing you see is the large produce section, which the brothers call “the heart of the store.” Their family’s business has always been focused on produce, and the new, larger space will give them the chance to offer new items, depending on the season. They’ve also got a large butcher counter, with plenty of room for their signature housemade sausages, as well as meat from local producers including Marin Sun Farms and Llano Seco Rancho. A locker for dry-aging meat has also been installed, so you’ll be able to purchase aged steaks too. There is an extensive selection of meats available for special order—almost anything can be ordered and on-site in a day or two. There is also a large commissary kitchen, which will stock their large prepared food section. There is a large salad bar and hot bar area, along with plenty of refrigerator space for other prepared items to take home. The deli will offer sandwiches, salads, and sides, as well as a live sushi preparation counter, which the brothers say has been very popular at their other locations. As for groceries, there is a large portion of the store set aside for bulk items, as well as rows of dry goods and other groceries. They will offer plenty of staples, as well as local products and harder-to-find gourmet items. Gus’s Community Market is scheduled to open Wednesday November 11th, and hours will be daily 7am-10pm. There is limited parking available, as well as bicycle parking and outdoor seating. 2111 Harrison St. at 17th St., 415-431-9300. Since it’s fall cookbook season, here are a few chefs and authors on tour you won’t want to miss. 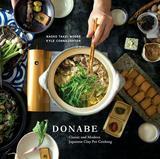 On Monday November 2nd is a dinner to celebrate Donabe: Classic and Modern Japanese Clay Pot Cooking (Ten Speed Press), by Japanese home-cooking expert and teacher Naoko Takei Moore and chef Kyle Connaughton (of the upcoming Single Thread in Healdsburg), at ~BAR TARTINE~. It will be a four-course dinner featuring dishes inspired by the book, like sizzling tofu and mushrooms in miso sauce and steam-fried black cod with crisp potatoes, leeks, and walnut-nori pesto. $80 (books and beverages sold separately). Seatings begin at 5:30pm. Call 415-487-1600 for reservations. On Thursday November 19th, San Francisco will be one of the stops in the six-city North American book tour for The Nordic Cookbook (Phaidon) by Magnus Nilsson (Fäviken Magasinet). Nilsson, Phaidon, and Dinner Lab will be hosting a series of dinners with different Nordic chefs, and San Francisco is lucky to have chef Emma Bengtsson visiting, originally from Sweden but now living in New York (at the two Michelin-starred Aquavit), making her the first female Swedish chef and second-ever U.S. female chef to run a two-starred restaurant. 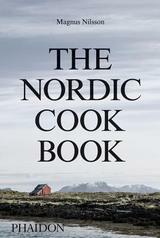 Nilsson will speak about The Nordic Cookbook at the event, and Bengtsson will be preparing a five-course dinner inspired by the traditional recipes and traditions documented in Nilsson’s book. Tickets are $175 per person and includes the five-course menu, beverages, and signed book ($49.95). Seatings are 6:30pm and 8:30pm. Location will be revealed closer to the event. The deck at Bay Wolf. Photo via Facebook. Rebekah and Rich Wood of Wood Tavern and Southie. Photo courtesy of Wood Tavern. After ~BAY WOLF~ closed in September, many were left wondering who would be the next taker for the historic space. It ends up it is Rich and Rebekah Wood of Wood Tavern and Southie, who just signed the lease on Friday. Rich said, “It’s a dream come true” and it ends up the Woods had one of their first dates at Bay Wolf; they also became good friends with Michael Wild over the years. They plan to open an intimate American brasserie, but they love the quaint nature of the space and that it’s a touch fancy, and want to preserve that. Describing Wood Tavern as the big brother and Southie as the little brother, Wood states this is definitely going to be the girl in the family. Chef-partner and Oakland-born Yang Peng, who started at Wood Tavern as a pantry cook in 2007 and worked her way up to executive chef, will be overseeing the new project. They will be doing some exterior and interior work on the place and hope to open in midsummer of 2016. There isn’t a name yet, but one thing they will have is a liquor license; they ended up winning in the license lottery, how’s that for good luck? Imagine a martini before your meal, next year! 3853 Piedmont Ave. at Rio Vista, Oakland. Elmwood neighborhood restaurant ~THE ADVOCATE~ is now serving weekend brunch on Saturday and Sunday from 10:20am-2:30pm. The brunch menu includes new dishes like caramelized French toast with huckleberries and dulce de crescenza, or cazuela-baked eggs with peperonata, cannellini, and pickled pepper salsa, as well as popular items from their regular menu, like chicken liver toast and a wood-fired burger. In addition to brunch dishes, you’ll find a selection of brunch beverages, including a rhubarb spritz with City of London gin, Aperol, lemon, rhubarb, and cava, or try their house Bloody Mary with Sobieski vodka, tomato, chipotle, lime, urfa pepper, and escabeche. 2635 Ashby Ave. at College, Berkeley, 510-370-2200. Chowhound brings word that East Bay ramen pop-up IppoRamen is now appearing at Tokyo Fish in Berkeley, with about five seats at a folding table. Also via Chowhound: there’s a new banh mi place on the North Oakland/Berkeley border called ~MAI BANH MI~. The reports on Yelp mention friendly owners, good food, and a nice price. 6601 Telegraph Ave. at 66th St., Oakland, 510-788-5755. Tonight (October 27th), ~ KRONNERBURGER~ is hosting Chris Fischer from Beetlebung Farm on Martha’s Vineyard. He’s doing a dinner promoting his new book, The Beetlebung Farm Cookbook: A Year of Cooking on Martha’s Vineyard (5pm-10pm), and the theme is rabbits. Email to reserve. Also for your calendar: there will be a release dinner with Scribe Winery on November 2nd. 4063 Piedmont Ave. at 41st St., 510-823-2371. The Pine Cone Diner. Photo via Facebook. Fans of the classic and kitschy ~PINE CONE DINER~ (and its delicious chilaquiles and pancakes) will be dismayed to hear it has closed after 19 years. No reason was given, but some posts on their Facebook page allude to some restructuring and difficulties finding a line cook. (Point Reyes Light via Eater.) 60 4th St., Point Reyes Station. Soil & Vine delivers a variety of unique and exceptional wines straight to your door. Bonus: free next-day delivery! Our unique wine selection has been curated by seven-year veteran of the French Laundry, Ruben Moreno. In 2011, Ruben quit his job, cashed in his savings to buy an old Peugeot, and camped around Europe, visiting little-known, small family estates that focus on organic and sustainable winemaking. Stock up on our crisp and fresh Prosecco ($25); it’s a staple for holiday entertaining. More into reds? Try our A&G Fantino Rosso Dei Dardi ($26), this 100 percent Nebbiolo is a perfect match for an earthy fall meal! We even offer monthly wine subscriptions; members never miss out on new wines and exclusive releases. Care to indulge on Champagne, truffles, and caviar? Join us for a decadent nine-course dinner at Michael Warring on December 8th. Chef Warring has created a special menu where each dish pairs with one of our wines. With only 17 seats available, it’s sure to sell out fast. Exclusive offer: tablehopper readers save $10 when they spend $50. Use code: HOPPER at checkout. The Platform room. All photos © tablehopper.com. The main bar (with the last-call bell). 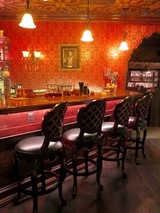 The Gin Palace back room and bar. Farmer’s cheese with turmeric oil, yogurt-roasted carrots, and naan. Walking through the door at ~WHITECHAPEL~ last Thursday at a preview party, I completely stopped in my tracks. I just wasn’t quite prepared for the extent Martin Cate, Alex Smith, and John Park were going to take this “gin bar and private club in an abandoned London Underground train station” theme—but I also wasn’t surprised, because, hello, Smuggler’s Cove. The space is truly spectacular. The main room, The Platform, has a barrel-vaulted ceiling that feels just like you walked into a historic London Underground station. Along the right side is a long and curving tufted crimson banquette that forms into booths/cozy seating areas for groups (with marble-topped tables) as it curves along the length of the room. The tile work along the wall is beautiful: the authentic acanthus tiles were designed for the London Underground in 1908, and Fired Earth in the UK still produces them today (to replace tiles in the historic stations). Kudos to Ignacio “Notch” Gonzalez (Top Notch Customz), who designed the bar and is one heck of a craftsman. No detail was ignored, and it also looks like no expense was spared. To the left is the lengthy bar, with backlit bottles of gin lining the back bar. Whitechapel has more than 350 gins (which will be growing! ), making it the largest selection of gin in North America, including rare selections that date back to the 1930s (you’ll see them at the far end of the room in gin lockers). Also of note behind the bar is the last-call bell, cast to order by the Whitechapel Bell Foundry in London, which cast the Liberty Bell and Big Ben—and it’s the UK’s oldest continuously operating business (how’s that for some history?). 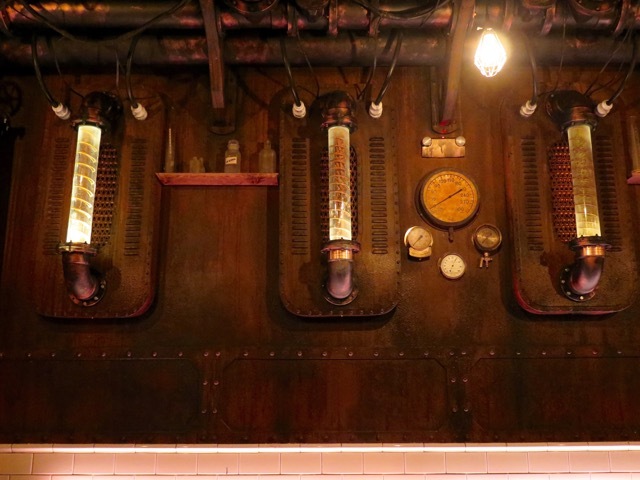 If you swing a hard left when you first come into the space, you’ll find a room called The Distillery, with nine “Ginfusion Tubes” bubbling along the walls—which actually contain real gin botanicals—giving it a bit of a mad professor’s workshop vibe. You’ll notice vintage distilling elements and more than 5,000 hand-applied rivets, giving it a quirky industrial look. 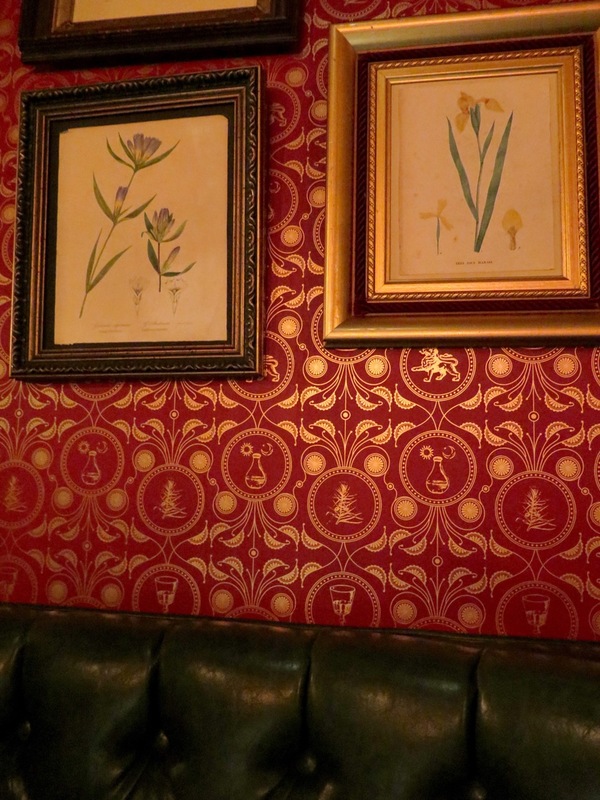 If you walk to the back of The Platform room and take a left, you’ll find the Gin Palace, a room with custom wallpaper and a very ornate style. It’s an homage to the public houses that gin brands started in 1820s London. There’s an intimate bar and a smattering of tables and corner booths where you can sit down and enjoy some food from the kitchen. So, the drinks! The menu is downright impressive, with 18 original cocktails, like the aromatic Gilbert’s Melodeon (Sipsmith gin, green Chartreuse, pineapple gum, mint, lime), all $12-$13. There are more than 100 cocktails in all, showcasing the history of gin and genever. (Take a look at Camper English’s recent piece as he tastes through the cocktails.) 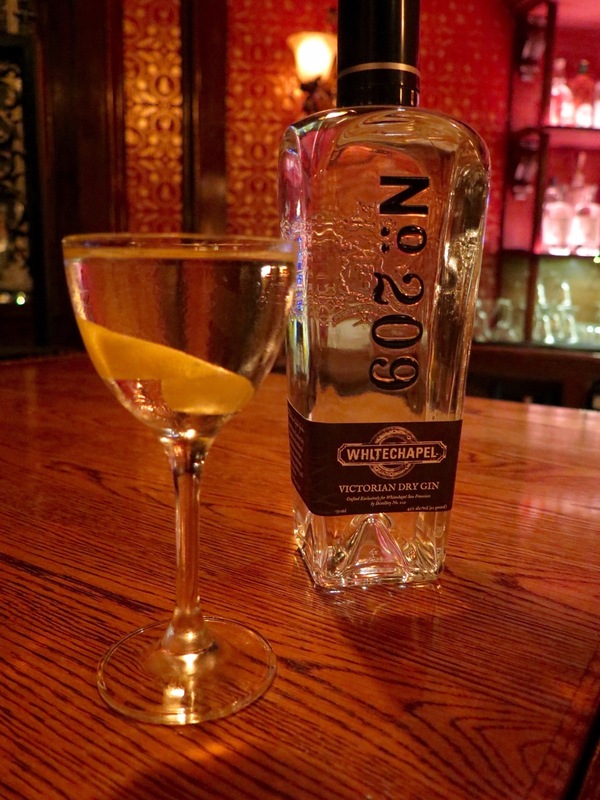 Be sure to try the custom house gin made by Distillery 209, the Whitechapel Victorian Dry Gin. Look for upcoming classes, and Keli Rivers will be on the floor to help impart her vast gin knowledge and expertise. There’s also a kitchen, and chef David Murphy (previously at Uchi, Austin) has crafted a creative menu—with some spins on many classics—that integrates British, Dutch, and Bangladeshi influences (like the farmer’s cheese with turmeric oil, yogurt-roasted carrots, and naan, and the mussels vindaloo with coriander chutney). You can be brave with the brain and toast, and go for the lightened version of Dutch rarebit, with Gouda and beetroot chutney on pumpernickel. Our table was quite impressed with “a fish and a chip”—which revealed a perfectly fried fillet of rock cod, served with a latke-like potato “chip,” curryracha, and garlic aioli. Another easy bite for people to share is the trio of steam burgers, spiked with tomato marmalade, horseradish tartare, and Cotswold cheese. You’ll note Murphy’s pedigree when the coffee banoffee comes out, a complex and contemporary presentation of a classic dessert that you wouldn’t expect to find in a bar (hello, banana ash). Food is available until midnight nightly, and you’ll eat well. Come visit this beautiful bar soon, one that San Francisco is so lucky to have. Whitechapel is open Sun-Wed 5pm-1am, Thu-Sat 5pm-2am. 600 Polk St. at Turk, 415-292-5800. 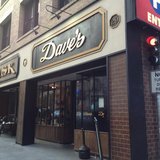 Some updates for you on recently closed/closing dive bars, starting with ~ZEKE’S~. We saw some ABC license activity hit the wires, and Hoodline followed the story, discovering that the former director of operations for the Golden Bear Restaurant Corporation (MoMo’s, Pete’s Tavern, Pedro’s Cantina), Paul Cardinale, will be taking over the bar. Fortunately he just wants to give it a light update, keep it a neighborhood bar, and plans to open in a couple of months. The new name is ~LOCAL TAP~. 600 3rd St. at Brannan, 415-392-5311. More Future Bars news: gossip is rippling around that they are (potentially) opening a tiki bar adjacent to Rickhouse in the FiDi (it seems like it’s going to be an expanded area/tiki room in the current space). Stand by for more news from Doug Dalton and Brian Sheehy on this soon—sounds like springtime will be targeted launch, but permitting has its own timing. And Hoodline reports ~LUCKY 13~ has reopened its patio after being forced to close it a few months ago due to some licensing issues. Sorted! 2140 Market St. at 14th St., 415-487-1313. Wine Down’s Jaime Hiraishi and Sarah Garand. Photo courtesy of Wine Down. Some wino tidbits for you. We have been tracking the upcoming ~WINE DOWN~ since July, and now the owners are ready to talk (they just launched an Indiegogo campaign). Co-owners Sarah Garand and Jaime Hiraishi wanted to create the after-work space they always sought: a comfortable place to enjoy quality wine that wasn’t too expensive. They really care about value (the average glass of wine will be $10), a laid-back and friendly vibe, and sustainability is also important to them. They will serve local wine (the list of 16 wines will always be changing), craft beer (5), and have some bites too. There will be bottles available for retail sales too. They add: “Some names might be familiar to guests (like Scholium, Broc, and Banshee) and we’re also excited to introduce people to some smaller producers like Harrington Wines from the Dogpatch or Lusu Cellars in Berkeley.” They hope to open in early 2016. 685 Folsom St. at 3rd St. Fellow lovers of ~K&AMP;L WINE MERCHANTS~: do note they are moving into their new and bigger space (in the former TJ Maxx) and are currently closed through Thursday October 29th, reopening on Friday October 30th at 10am. (Thanks, Hoodline!) 855 Harrison St. at 5th St.
More wine shop news: New York’s Flatiron Wines is opening a shop in The Palace Hotel in the former Kyo-ya sushi restaurant. Look for boutique wines, international selections, spirits, and more. January 2016 is the targeted opening. (Via Hoodline.) 2 New Montgomery St. at Market. A Pencils for Kids school. Photo from Pencils for Kids website. 875 Howard St. at 5th St. The San Francisco Chapter of Pencils for Kids is throwing a party on Monday November 9th at 6pm at CARAT in SoMa called Small World Big Flavors. The party includes food from local restaurants like Hawker Fare and Burma Superstar, along with special wine pairings from local winemakers and beer pairings too—because you know there will be some heat. Plus, there will be a silent auction with fab prizes, including wine and travel. The evening begins at 6pm, and tickets are $150 per person. Proceeds go to Pencils for Kids, an organization dedicated to helping children in need in developing countries attend school, and their projects in Bali, Myanmar, and Thailand. 875 Howard St. at 5th St.
A tablehopper reader who was dining at Amber India on Yerba Buena Lane was alerted to the fact that Supreme Court Justice ~Sonia Sotomayor~ was dining in the private room with a group, and you know security was in effect.